TACLOBAN, Philippines As many as 10,000 people are believed to have died in one Philippine city alone when one of the worst storms on record sent giant sea waves, washing away homes, schools and airport buildings, officials said Sunday. Ferocious winds ravaged several central islands, burying people under tons of debris and leaving corpses hanging from trees. Regional police chief Elmer Soria said he was briefed by Leyte provincial Gov. Dominic Petilla late Saturday and told there were about 10,000 deaths in the province, mostly by drowning and from collapsed buildings. The governor's figure was based on reports from village officials in areas where Typhoon Haiyan slammed Friday. Tacloban city administrator Tecson Lim said that the death toll in the city alone "could go up to 10,000." Tacloban is the Leyte provincial capital of 200,000 people and the biggest city on Leyte Island. The Red Cross had estimated that 1,200 people were killed in the Philippines, as reported by Reuters. On Samar Island, which is facing Tacloban, Leo Dacaynos of the provincial disaster office said Sunday that 300 people were confirmed dead in Basey town and another 2,000 are missing. He said that the storm surge caused sea waters to rise 6 meters (20 feet) when Typhoon Haiyan hit Friday, before crossing to Tacloban. There are still other towns on Samar that have not been reached, he said, and appealed for food and water. Power was knocked out and there was no cellphone signal, making communication possible only by radio. Reports from the other four islands were still coming in, so far with dozens of fatalities. It weakened Sunday to 166 kph (103 mph) with stronger gusts and was forecast to lose strength further when it hits northern Vietnam's Thanh Hoa province early Monday morning. In hardest-hit Tacloban, about 300-400 bodies have already been recovered but there are "still a lot under the debris," Lim said. A mass burial was planned Sunday in Palo town near Tacloban. Many corpses hung on tree branches, buildings and sidewalks. "On the way to the airport we saw many bodies along the street," said Philippine-born Australian Mila Ward, 53, who was waiting at the Tacloban airport to catch a military flight back to Manila. "They were covered with just anything - tarpaulin, roofing sheets, cardboards," she said. Asked how many, she said, "Well over 100 where we passed." Interior Secretary Mar Roxas said a massive rescue operation was underway. "We expect a very high number of fatalities as well as injured," Roxas said after visiting Tacloban on Saturday. "All systems, all vestiges of modern living - communications, power, water - all are down. Media is down, so there is no way to communicate with the people in a mass sort of way." President Benigno Aquino III said the casualties "will be substantially more" than the official count of 151 - but gave no figure or estimate. He said the government's priority was to restore power and communications in isolated areas to allow for the delivery of relief and medical assistance to victims. The U.S. and other governments and agencies were mounting a major relief effort "because of the magnitude of the disaster," said Philippine Red Cross chairman Richard Gordon. CBS News correspondent Seth Doane reports from Beijing that two-and-a-half million people may now be in need of food aid, according to the United Nations World Food Programme. "We're very concerned about the situation in the Philippines right now, so we just have to see how we can get food to those people very quickly," chief spokeswoman Bettina Luescher told CBS News. Even by the standards of the Philippines, which is buffeted by many natural calamities - about 20 typhoons a year, earthquakes and volcanic eruptions - the latest disaster shocked the impoverished nation of 96 million people. The airport in Tacloban, about 580 kilometers (360 miles) southeast of Manila, looked like a muddy wasteland of debris, with crumpled tin roofs and upturned cars. The airport tower's glass windows were shattered, and air force helicopters were busy flying in and out at the start of relief operations. 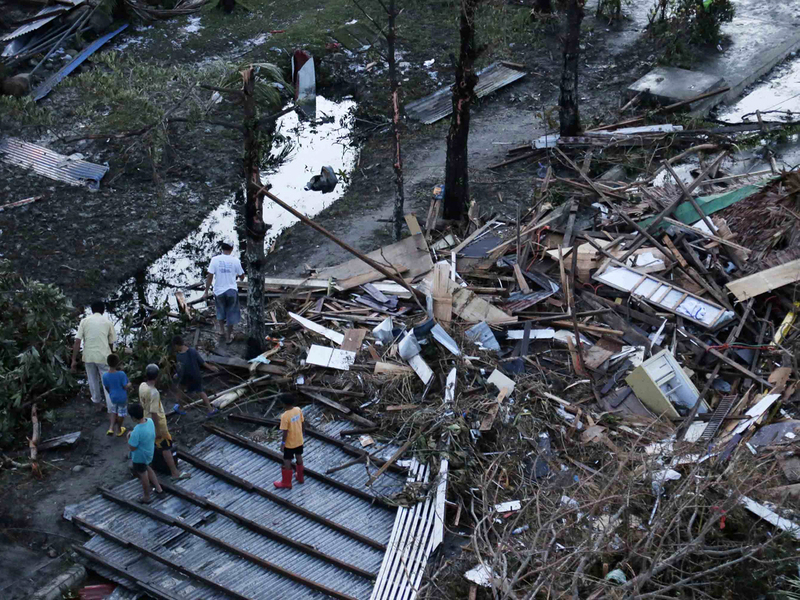 "The devastation is, I don't have the words for it," Roxas said. "It's really horrific. It's a great human tragedy." Defense Secretary Voltaire Gazmin said Aquino was "speechless" when he told him of the devastation the typhoon had wrought in Tacloban. "I told him all systems are down," Gazmin said. "There is no power, no water, nothing. People are desperate. They're looting." The city's two largest malls and groceries were looted and the gasoline stations destroyed by the typhoon. Police were deployed to guard a fuel depot to prevent looting of fuel. On Sunday, the city's overwhelmed services were reinforced by 100 special police force units sent in from elsewhere to help restore peace and order. "On the way to the airport we saw many bodies along the street," said Philippine-born Australian Mila Ward, 53, who was waiting at the airport to catch a military flight back to Manila. U.S. Marine Col. Mike Wylie surveyed the damage in Tacloban prior to possible American assistance. "The storm surge came in fairly high and there is significant structural damage and trees blown over," said Wylie, who is a member of the U.S.-Philippines Military Assistance Group based in Manila. At the request of the Philippine government, Defense Secretary Chuck Hagel directed U.S. Pacific Command to deploy ships and aircraft to support search-and-rescue operations and airlift emergency supplies, according to a statement released by the Defense Department press office. Tacloban is near the Red Beach on Leyte Island where U.S. Gen. Douglas MacArthur waded ashore on October 20, 1944, fulfilling his famous pledge, "I shall return," made in March 1942 after President Franklin D. Roosevelt ordered him to relocate to Australia as Japanese forces pushed back U.S. and Filipino defenders. Tacloban was the first city to be liberated by U.S. and Filipino forces and served as the Philippines' temporary capital for several months. It is also the home town of former Filipino first lady Imelda Marcos, whose nephew, Alfred Romualdez, is the city's mayor. The president of the European Commission, Jose Manuel Barroso, said in a message to Aquino that the EC had sent a team to assist the Philippine authorities and that "we stand ready to contribute with urgent relief and assistance if so required in this hour of need." One Tacloban resident said he and others took refuge inside a parked Jeep to protect themselves from the storm, but the vehicle was swept away by a surging wall of water. "The water was as high as a coconut tree," said 44-year-old Sandy Torotoro, a bicycle taxi driver who lives near the airport with his wife and 8-year-old daughter. "I got out of the Jeep and I was swept away by the rampaging water with logs, trees and our house, which was ripped off from its mooring." "When we were being swept by the water, many people were floating and raising their hands and yelling for help. But what can we do? We also needed to be helped," Torotoro said. In Torotoro's village, bodies could be seen lying along the muddy main road, as residents who had lost their homes huddled, holding on to the few things they had managed to save. The road was lined with trees that had fallen to the ground. Vice Mayor Jim Pe of Coron town on Busuanga, the last island battered by the typhoon before it blew away to the South China Sea, said most of the houses and buildings there had been destroyed or damaged. Five people drowned in the storm surge and three others were missing, he said by phone. "It was like a 747 flying just above my roof," he said, describing the sound of the winds. He said his family and some of his neighbors whose houses were destroyed took shelter in his basement. Philippine broadcaster ABS-CBN showed fierce winds whipping buildings and vehicles as storm surges swamped Tacloban with debris-laden floodwaters. In the aftermath of the typhoon, people were seen weeping while retrieving bodies of loved ones inside buildings and on a street that was littered with fallen trees, roofing material and other building parts torn off in the storm's fury. All that was left of one large building whose walls were smashed in were the skeletal remains of its rafters. ABS-CBN television anchor Ted Failon, who was able to report only briefly Friday from Tacloban, said the storm surge was "like the tsunami in Japan." "The sea engulfed Tacloban," he said, explaining that a major part of the city is surrounded on three sides by the waters between Leyte and Samar islands. Tim Ticar, a local tourism officer, said 6,000 foreign and local tourists were stranded on the popular resort island of Boracay, one of the tourist spots in the typhoon's path. U.N. Secretary-General Ban Ki-moon offered his condolences and said U.N. humanitarian agencies were working closely with the Philippine government to respond rapidly with emergency assistance, according to a statement released by the U.N. spokesperson's office. UNICEF estimated that about 1.7 million children are living in areas impacted by the typhoon, according to the agency's representative in the Philippines Tomoo Hozumi. UNICEF's supply division in Copenhagen was loading 60 metric tons of relief supplies for an emergency airlift expected to arrive in the Philippines on Tuesday. In Vietnam, preparations for the typhoon were underway. About 600,000 people from the central region who had been evacuated returned home because the storm changed course and was instead heading for the northern coast, where authorities began evacuating nearly 100,000 in three northern provinces.